Please welcome Michelle Knudsen to GreenBeanTeenQueen! She's sharing a playlist of her favorite musical theater songs in honor of her latest book, Evil Librarian. About the Book: (from Goodreads): #EvilLibrarian He’s young. He’s hot. He’s also evil. He’s . . . the librarian. Chess is one of my all-time favorite musicals to listen to (both the Broadway and London versions, which are very different from each other) although I’ve never yet seen it performed on stage. This is one we used to sing together in the car on the way to rehearsal. I’ve never seen this one live either, although (of course) I’ve read the book it’s based on. They did this one my freshman year of high school, and it was a lot of fun to watch and listen to. I still really love all the music, but this is one of the songs I most often find randomly popping into my head. I’d go with the movie soundtrack version on this one. Does that still count? I saw the movie in the theater 10 times when it first came out. And I still love to sing this one in the car. And outside the car. I still know every word by heart. It was hard deciding between this one and “On the Steps of the Palace.” Those are my two favorite songs to sing from this show. I saw the Public Theater “Sondheim in the Park” production in 2012 which was amazing (with the same two best friends mentioned in #7 below). One of my favorite songs from one of my favorite musicals of all time. I think I picked this one for this list over “Stars” (another of my favorites) because it’s got everyone in it, and I love big ensemble numbers so much. I first encountered Side Show at Broadway on Broadway in NYC with two of my best friends (the two friends Evil Librarian is dedicated to, actually) and I fell in love with it at once. I didn’t get to see it on Broadway before it closed, so I’m super excited about the revival opening this fall! I love to sing this one, but never where anyone can hear me. I know I can’t really sing it. I’m sure it sounds ridiculous and horrible when I try. But I love to anyway. I couldn’t end this list without including something from Sweeney Todd, which is the show Cyn and her classmates are doing in the book. One of my all-time favorites. If you’ve never seen it, buy or borrow a copy of the 1982 recording of the Angela Lansbury/George Hearn performance and watch! I love this song because it’s such a great example of the blending of the darkness and humor and madness and brilliance that runs through the entire show. OMG, apparently me and Michelle are twins, because Chess is also my all-time favorite musical, even though I have also never seen it performed live. I think I know every word to every song on the Broadway recording :) Obviously, now I have no choice but to read Evil Librarian! 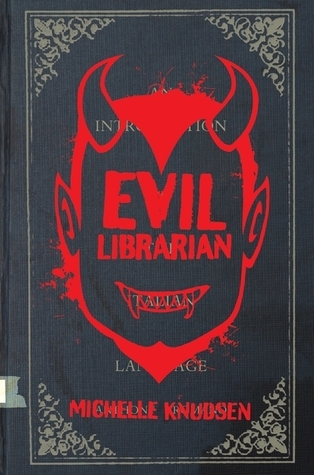 Evil Librarian sounds great, I'm off to check out the other tour stops. Thanks for putting this on my radar.